People always talk about finding one’s soul mate as if it is one of the primary quests in life. I suppose for me it has always begged the question, initially anyway, that for something as profound and prodigious as the soul, how can it possibly only have one mate. Growing up I was always struck by this notion probably because it sounded like such a pressure filled assignment, i.e. go search the world and come back with that ONE person that ‘completes you.’ Only one?? Geesh, kind of stingy, no? What about four people that suit me perfectly and I can narrow it down over a few months like an episode of American Idol - seems much more fair. As I got older I realized how truly spot on I was with my suspicions. And of course, I realized that once again society had to spin some perfectly packaged goal to shoot for to remind everyone where the bar is - and more importantly, if you don’t reach it, apparently you are settling for second best. Gosh, talk about making the area of romance even more challenging and disheartening. Here’s the thing about soul mates: on paper they sound great. According to the definition at large, they’re the yin to your yang, they can finish your sentences, anticipate your every move, fill your wants and desires in a way no one else can, intellectually match you beat for beat…I’m sorry, I have to stop, I’m starting to feel nauseous. Talk about a delusionary goal. I’m as romantic as the next person, but you're telling me that a mere mortal is supposed to fill all these requirements? And how about after living with this said ‘soul mate’ for ten years, then how complete are they going to make you feel? I have a sneaking suspicion that even in the mighty connection of man and woman soul mate, they are going to quickly become that man that uses too much toilet paper or the woman that shops far too much. Soul mate, shmoulmate. This is reality we are talking about. The other thing about this whole label of soul mates is the fact that in crude terms, not everyone finds their absolute perfect match. Like it or not, no matter how hard some people search, some people just never seem to find that 'perfect' partner for them. Furthermore, some people end up coupling up - so to speak - for a whole host of reasons, and for every couple this comes down to different things. For some timing plays a huge role in their union, others place more importance on compatibility and suitability then let’s say flat out romance and passion. 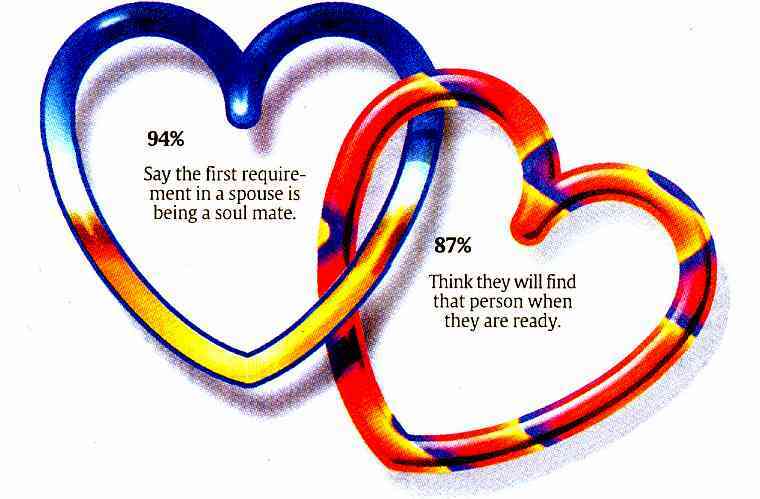 And of course others make damn sure you know they married their ‘soul mate’ even if the person is far from that. I suppose it is one of those things that is very hard to define and if you are lucky to have found that one person that suits you to a tee, you may want to keep quiet about it so as not to make you the annoying person on the block that swoons about true and perfect love. Because you know that the neighborhood betting pool will be placing bets on which of you is getting the more expensive divorce lawyer. Sorry, too jaded for a Monday morning?